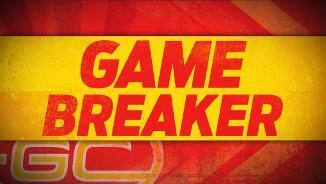 Gold Coast has managed to hang on for a deserved win despite fading defensively late in the game. The Suns won the clearances (5631) which helped give a territorial advantage from which they punished defensive half turnovers by North Melbourne. Gary Ablett finished with 37 disposals, and equal gamehighs for clearances (ten) and score involvements (11). Jarryd Lyons also had a prolific game with game-highs for contested possessions (23) and disposals (39). A flurry of late goals with the Suns dominating clearances (194 this quarter), and scores from stoppages 14-0, while the Kangaroos have scored an amazing five goals from defensive 50 chains in the final quarter. Gold Coast lead the clearances 154 in the final quarter, and it is this dominance which has given it scoring chances against the fast finishing Kangaroos. Four goals this quarter now from defensive 50 chains for the Kangaroos, with the Suns defensive pressure falling away dramatically. The only time this season the Kangaroos have kicked four goals in a game this way was against Gold Coast in round six. Another goal to the Kangaroos coming from a defensive 50 chain (their third of the quarter). They have now scored a seasonhigh 25 points from such chains. Another terrific forward 50 tackle (this time from Jack Martin) has set up the Suns for their fourth goal following a forward 50 intercept. Gold Coast has scored a seasonhigh 25 points from this source today. North Melbourne has generated an inside 50 from five of its seven defensive 50 chains this quarter with the Suns tiring. In the first three quarters, the Kangaroos generated only four inside 50s from 31 such chains. Two quick goals to the Kangaroos keeps them in the game. Both of these goals came from chains started in the defensive 50, with the Suns now struggling to stop the ball movement of North Melbourne. Gold Coast lead 4436 for first possession at stoppages, and has converted this into a major 46-27 advantage in clearances. 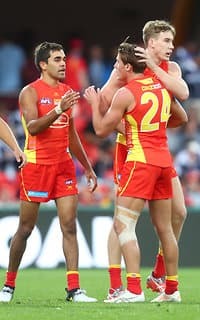 While the inside 50 count is relatively even (4844 in favor of the Suns), Gold Coast lead 39-15 for effective disposals in the forward 50, indicating better quality entries and control. Suns InterchangeCallum Ah Chee off due to an injury. Good forward pressure by Peter Wright, and a third score assist from Jack Martin ends the run of scores to North Melbourne. The Suns have now scored 38 points from forward half intercepts, a mark they have only beaten once this season. Since the 13 minute mark of the third quarter, the Kangaroos lead inside 50s (143) and have scored 3.4. (22) while keeping Gold Coast scoreless. Three goals in a row to the Kangaroos, and four goals now to Waite who has a gamehigh nine score involvements, and is causing the Suns plenty of problems. Jarryd Lyons has now registered careerhighs for contested possessions (19) and disposals (33). Andrew Swallow is the only other player to have recorded ten contested possessions. In the first half the Suns were able to generate 11 inside 50s from 25 defensive half chains. In the third quarter, they were only able to generate five inside 50s from 23 such chains with North Melbourne better at disrupting their ball movement. A much improved quarter from the Kangaroos, who won the inside 50s (178), forward 50 marks (4-2) and forward 50 tackles (7-2). This helped generate nine forward half intercepts from which they scored 3.2.(20). Backto-back goals for the Kangaroos who have been the better team this quarter. North Melbourne lead 18-10 for intercept possessions this quarter, and 16-8 for inside 50s. North Melbourne has generated seven of the last eight inside 50s, and after scoring four consecutive behinds, has finally scored a goal to cap this period of control. After having kicking efficiency of 67 percent in the first half, the Suns have kicked with just 50 percent efficiency this quarter. As a result of this less effective ball movement, North Melbourne lead the inside 50 count 106 this quarter. North Melbourne has failed to capitalise on scoring opportunities from centre bounces. The Kangaroos have scored 1.5. (11) from ten centre bounce clearances, while the Suns have scored 0.1. (1) from 11 such clearances. Jarryd Lyons giving the Suns great drive and currently has a gamehigh 15 contested possessions. No other player on the ground has registered ten such possessions. 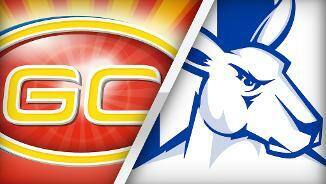 North Melbourne has kicked the first goal of the third quarter, and it followed a forward half intercept. The Kangaroos average 29 points from 22 forward half intercepts, and today have 14 points from 12 such intercepts. Gold Coast only lead 108 in forward 50 marks, but has scored 7.1. (43) from set shots at goal, while North Melbourne has scored 2.4. (16) from its set shots. 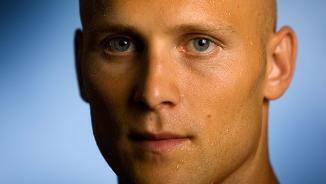 Gary Ablett already up to 20 disposals in game number 300 today against the Kangaroos . He has averaged more player rating points against North Melbourne (27.8) than against any other team. The Suns have been better when the ball is in dispute, leading 93 in one-on-one contest wins, and 78-69 in contested possessions. Gold Coast has scored 5.2. (32) from 16 forward half intercepts. North Melbourne has scored 1.2. (8) from its nine forward half intercepts. Gold Coast average just 26 points per game from this source. Another good quarter from the Suns sees them lead by 33 points. 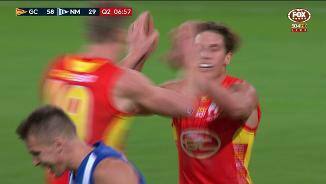 North Melbourne has struggled to disrupt the Gold Coast ball movement, with the Suns leading the inside 50 count 3623, and then punishing the North defensive half turnovers. North Melbourne finally gets a goal this quarter and it again comes from a stoppage. The Kangaroos lead 2221 in scores from stoppages, despite trailing the clearances 18-24. Luke McDonald and Andrew Swallow have a teamhigh 11 disposals for the Kangaroos. Gold Coast has six players who have had more than 11 disposals, with its midfield dominant. A terrific run down tackle by Macmillan on Saad as he attempted to bounce set up the first score of the quarter for North Melbourne. Adam Saad has recorded 65 running bounces this season, 26 more than the next best player in the competition. In the second quarter, Gold Coast lead the inside 50s 155, clearances 8-3, and contested possessions 36-26, and has scored 4.2. (26) to zero this quarter. A terrific opportunistic goal from Ainsworth makes it six in a row for the Suns. The potent young forwards for Gold Coast are having a major scoreboard impact today with Lynch (three goals), Ainsworth (three) and Martin (two) all impressing. North Melbourne has already won four holding the ball free kicks today. 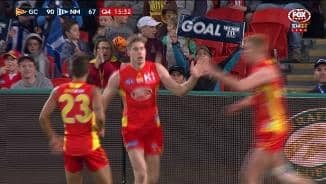 Gold Coast has been caught holding the ball 68 times this season, which is the most of any team. Five goals in a row the Suns who now have a gamehigh point lead. Gold Coast has scored 18 points from chains starting in the defensive 50, and average 18.5 points per game from this source (ranked third). Gold Coast has punished the North Melbourne turnovers, and now scored 3.2. (20) from eight forward half intercepts. The Suns average 26 points from 22 such intercepts. Jarryd Lyons is continuing his good form today, and currently has a gamehigh ten effective disposals and a team-high five contested possessions and three tackles. There has been only one intercept mark taken in this match by either team. The AFL average is 14 intercept marks per team this season. The Kangaroos have been fast starters this season, scoring 28.3 points in the opening quarter (ranked second). They have matched this in the first quarter today, but for the second week in a row have conceded six goals in the opening quarter. An open and high scoring first quarter ends with the Suns ten points the better. Gold Coast has been more effective with ball movement (effective disposals 8057) and generated more inside 50s (19-13) as a result. The Suns now have two first quarter goals from forward half stoppages and 26 points from forward half chains. Gold Coast average just 41 points per game from this such chains (ranked 16th). North Melbourne has scored 1.3. (9) from five centre bounce clearances. Gold Coast has not scored from any of its four centre bounce clearances. The Kangaroos are ranked third at scoring from this source. Marley Williams the late out for the Kangaroos has guarded the opposition small forward this season. 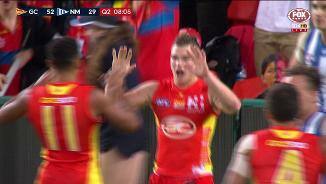 In his absence, Ben Ainsworth already has four score involvements for Gold Coast (including two goals). North Melbourne has now generated seven scores from just the ten forward 50 entries. The Suns have allowed their opposition to score a goal from 28 percent of inside 50s this season, which is the equal secondhighest percentage conceded. A clever finish by Hrovat gives the lead back to the Kangaroos. Hrovat has collected 25 loose ballgets in North Melbournes forward half this season, which is the most by any player at the club. After a scratchy first few minutes, the Suns have generated eight of the last nine inside 50 entries and scored three goals during this period. An excellent snap from Jack Martin gives the Suns their second goal, this time from a possession chain started in the defensive 50. The Suns have generated an inside 50 from 22 percent of their defensive 50 chains this season (ranked equal third). 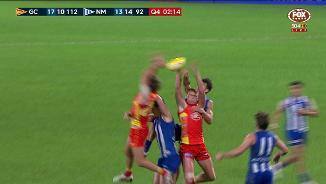 Some good tackling from Jack Martin forced the turnover that launched the first goal for Gold Coast. The Suns average just 26 points per game from forward half intercepts (ranked second last). Gold Coast has made a sloppy start defensively. The Suns have already missed two tackles, and only been effective with two of their other eight tackle attempts. Brayden Fiorini missing the Suns first shot at goal after taking their first forward 50 mark. Fiorini collected careerhighs of 23 uncontested possessions and 11 marks against the Saints last week. The Kangaroos leas the contested possession count 112 to start the game, and have had six of the first seven inside 50s in a fast start. Two inside 50s for the Kangaroos have resulted in two marks and goals to start the game. North Melbourne has scored from only 40 percent of its inside 50s when traveling interstate this season (ranked last). The first goal of the game follows a strong mark from Ben Brown. The Kangaroos have scored 53 percent of their goals from set shots this season, which is the highest percentage of any side. North Melbourne has been aggressive with the ball in its defensive half, directing 22 percent of its defensive 50 rebounds through the corridor (ranked second), and having the lowest kickto-handball ratio in the defensive half. Since Round 7, Jarrod Witts and Jarryd Lyons have combined for 28 effective hitouts, which is the second best ruckrover duo in this period. Two teams with contrasting styles in this game. Highpossession Gold Coast is ranked third for disposal differential and fourth for marks, while North Melbourne is ranked second last for disposal differential and last for marks. Gold Coast has recorded an uncontested possession rate of 65 percent this season, which is the highest percentage of any team. The Suns average 26 more uncontested possessions than their opposition (last season they averaged 29 less). Welcome to Metricon Stadium for the Gold Coast Suns v North Melbourne Round 15 clash. 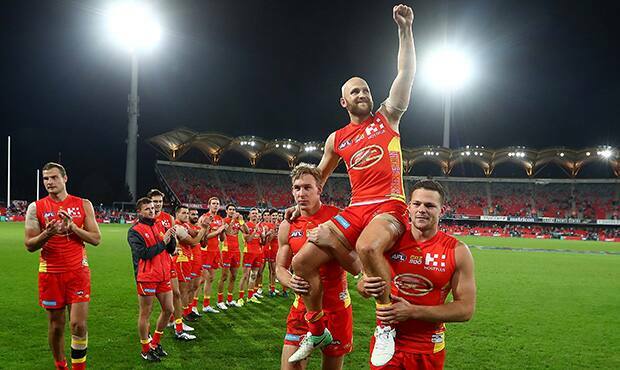 GOLD Coast has celebrated Gary Ablett's 300th match with a 19-point victory over North Melbourne at Metricon Stadium. Led by five goals from co-captain Tom Lynch on Saturday night, the Suns overcame a Kangaroos comeback in the second half to post an 18.10 (118) to 14.15 (99) win. 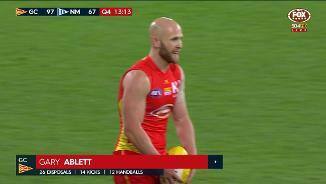 The Suns' sixth victory of the season keeps their faint finals hopes alive as dual Brownlow medallist Ablett marked his milestone match in style. Lynch, who hadn't kicked a goal in his past two matches, was the star of the night including a classy left-foot finish in the final term just when the visitors were threatening to rein in the Suns. Ablett finished the night with 37 disposals and narrowly missed a set shot from 50m in the final term which would have capped the evening for the 12,779 fans. Steven May, also celebrating a milestone in his 100th match, was solid in the backline for the Suns while Ben Ainsworth was impressive with a career-high four-goal haul. The Suns overcame a slow start where the Kangaroos kicked two early goals, with Lynch booting two majors at the end of the opening quarter to give the hosts a 10-point lead. A run of five unanswered goals in the second term blew that lead to 40 points, including Jack Martin's second classy right-foot snap from the left pocket of the match and a sensational soccer effort by Ainsworth. 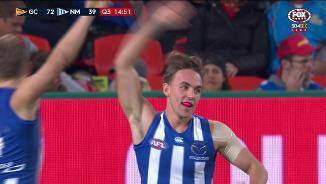 North responded after the main break, reducing the 33-point half-time gap to 23 at the final turn before Jarrad Waite's fourth of the night brought the game within three goals. Ben Brown picked up three majors while Luke McDonald was a ball magnet for the visitors with 31 disposals. Quickfire goals to Brayden Fiorini and Lynch settled the home team's nerves and the Suns held their opponents at arm's length to secure the points. 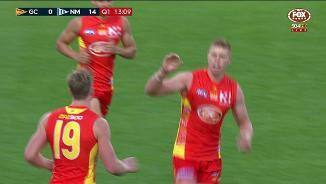 Gold Coast coach Rodney Eade was impressed with his side's ability to fight back when North Melbourne was threatening. "They had all the momentum and we made a couple of| silly errors, like usual, and it cost us, and then to kick those two, maybe three goals in the last six minutes, I think it showed the fight in the group," he said. 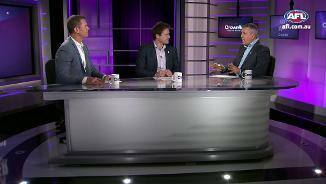 "We've spoken about the resilience. "We've been exposed in that a few games this year where we've fallen away. "It's the last seven or eight (games) we've had this fight, which is pleasing, it's something we're developing." Pearce Hanley's troublesome hamstring meant the Irishman didn't return for the second half and he'll be in doubt for next weekend's trip to Sydney to face the Swans, while Callum Ah Chee also had work done in the final term on a shoulder. 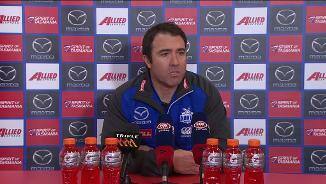 North Melbourne coach Brad Scott lamented his side's finishing, particularly in a disastrous second quarter. "We just lacked a bit of polish tonight," Scott said. "I thought our second quarter was just a bit of a dog's breakfast. "I thought about going next door to the timekeepers to see if we could try and bring half time forward because we just couldn't arrest some of the errors we were making in the second quarter and Gold Coast, to their credit, really looked to attack the game." Gold Coast: After sustaining a hamstring niggle against the Saints last week, Pearce Hanley twinged it again. After a scything second quarter run off half-back, the Irishman pulled up a short before leaving the field. He returned to finish the half but did come out again after the main break. 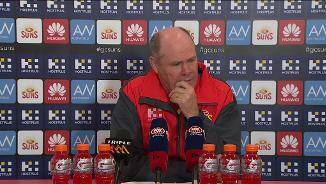 "He hasn't strained it," coach Rodney Eade said. "He didn't do it, but it feels the same as what it did last week. We'll just wait and see (if he plays next week)." 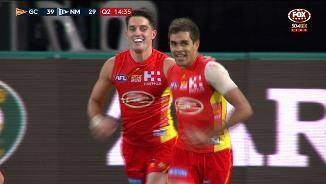 Callum Ah Chee played the final quarter with a sore shoulder and Eade said the small forward would have it assessed in the next few days. North Melbourne: After an exciting four-goal outing, Jarrad Waite was taken from the field in the final quarter with a calf problem. He had it iced and missed the final 20 minutes of the match. 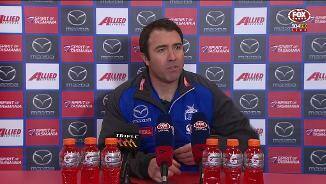 Brad Scott said he wasn't sure of the severity of the injury. "Fingers crossed he comes up OK but we can't give a definitive diagnosis just yet." Gold Coast might have kept its flickering finals hopes alive, but will face the competition's in-form team next Saturday when it travels to Sydney to play the Swans. North Melbourne hosts Fremantle next Sunday at Etihad Stadium.